The Justice Game with Dennis Lawson.I remember the stale Gentelmans club smell, old cigar smoke and cooking smells with a hint of old boat. as that is the lowest tide on the Clyde,She was a sad sight witout her masts moving under the bridges as the tide moved in. Not sure of her history but I think she may have done a polar expo as well as the Australian trade routes ?? 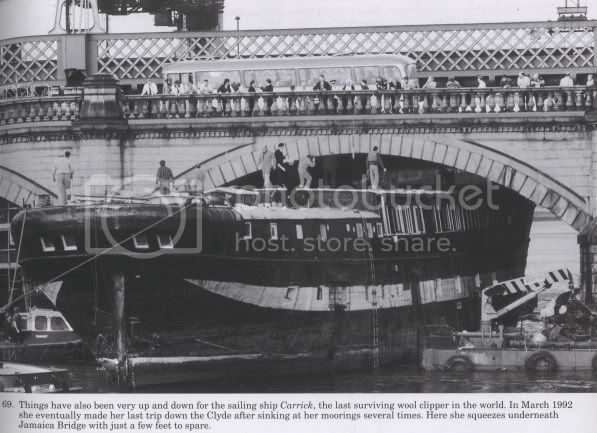 would be intrested to hear any history...Is it possible to see the Carrick at Irvine? Last edited by cumbo on Sun Apr 11, 2004 9:07 pm, edited 1 time in total. Cumbo.....your experience is cool....i have only been on the Carrick as she is now....almost stripped to the bone inside....but i can imagine the smells etc as you describe them. I remember her clearly when i was 10-13 years old and onwards...but when i boarded her recently for construction purposes, i fell in love! I took some more pictures today of where she used to sit, and i shall also make them available. In answer to your question, it is possible to see her at Irvine Harbour, (about 2 mins drive from "The Magnum Centre") where she lies in a dry berth. You might not get as close as i did, but you will be able to take pics from 20-30 foot away from her stern. I was fortunate enough to have "Access All Areas" As you will see in pics when they get posted. I remember the master head ( if thats the right term) being light blue and white always amazed me as a wee chap. "City of Adelaide" was her original name, and it is now her official name again. She ceased being SV Carrick after 1992...she was also HMS Carrick before that. The Modern Fossil wrote: I remember the master head ( if thats the right term) being light blue and white always amazed me as a wee chap. Steady on, Foss, old chap. The "head" in a ship is the lavvy, so it's well seen that your interest in toilets extends to the naval variety. I'll say no more. Sorry it's a bit wonky doon the left hand side, it was scanned in from a book that refused to be flattened! Great pics Clincher. Looks like it would cost millions to put her right. All that double diagonal timber work looks well rotten. The plan for The Carrick is that she will go to Adelaide permanently if the estimated £12 million is found to fully restore her. They are mostly likely to get her supposedly by a scheme that will involve a local (optional) levy which will help fund her restoration and move to Aus. This will depend on how quickly preperation works for the journey to Aus will take to complete. (Not the full restoration...only works that will keep her watertight etc and weatherproof) The shipwright involved in the project (very nice chap) reckons he can manage it in just over a year, upon which time there will be only 2 timeslots for The Carrick to be transported to Aus by a special ship designed for such purposes. That's the good news. If the timeslots are missed, the ship may not continue to receive funding to lie for another few years at her current berth and may finally have to be scrapped.....a tragedy considering that the ship has sailed to Aus & back 23 times, ran back & forth to Canada for 5 years been used as a hospital ship and a naval vessel, and sank THREE times....i call her "The ship that refused to die". I would love to see her restored in Glasgow again nevermind anywhere else....but The Government & Lottery people are'nt interested. Here's hoping it's a story with a happy ending!